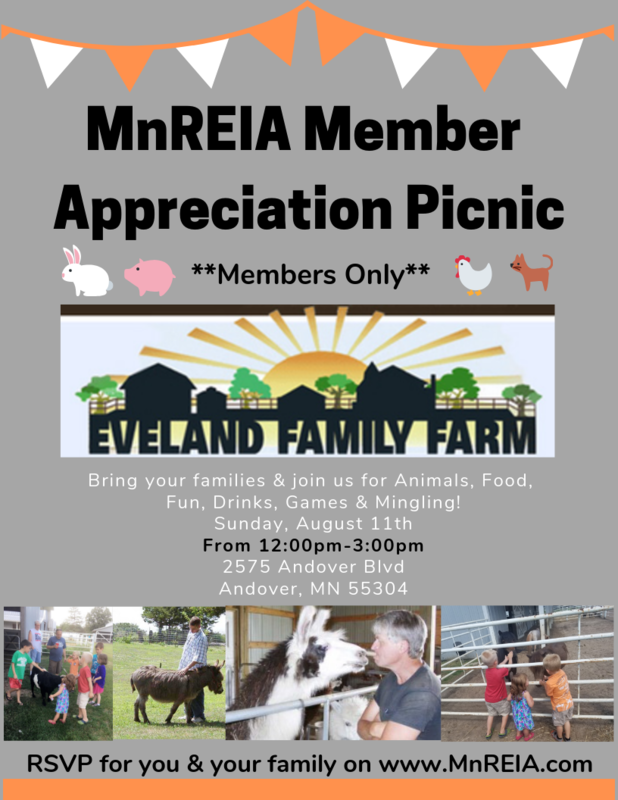 MnREIA Member Appreciation Picnic 2019! MnREIA Member Appreciation Event 2019! You spend all year working, learning and trying to improve your skills and knowledge. The question is, how much time do you spend relaxing and getting to know your fellow MnREIA members? We believe family is important and the Members Appreciation Picnic is our way of bring the family together and having a good time getting to know your MnREIA friends and their families. And what better place to have a picnic than a Petting Zoo Farm where the kids will have a blast and the adults will be able to relax and get to know other MnREIA Members outside of a structured training environment. This is a Members (and Family Members) Only Picnic. Bring your spouse, significant other, kids (if applicable) and any other friends that are close to you that you want to bring with you. We will have yard games, food, beverages and farm animals that love to be petted! All you have to do is RSVP with how many people you plan on bringing so we have a rough idea of how many people to plan for.